Pause And Clause, third in last year’s Coral Cup, emphasised his liking for the Cheltenham track with a doughty victory in the Martin Pipe Conditional Jockeys’ Handicap Hurdle. For trainer Emma Lavelle, it was a second Festival success, following Crack Away Jack’s victory two years ago. “He loves it round here. He run such a good race last year as well that I think this track suits him and it not a bad track to suit him,” said Lavelle. “Ideally he wants good ground and I was gutted when I saw the rain coming because I thought we were going to be in trouble, but because it’s still wet, it hasn’t bogged him down. This real heavy ground he’s run in all winter has just been a bit tough for him. “He’s run a fantastic race and Johnny’s given a great ride and kept him out of trouble and just kept kicking because he will always answer you. He’s not a speed horse. He’s a real galloper. He’s so gutsy and so genuine. “He’s just come to himself in his coat and everything. He’s done his job for the season now. 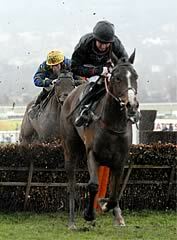 Whether we run him again or not this season, he’ll go novice chasing next year,” said the trainer. Farrelly commented: “Mr Pipe was slagging me this morning. We were on the gallops and he said: “here are all of the Cheltenham winning jockeys, except you Johnny” and I was laughing saying I hope I get one today. “This is my first ride for Emma and, to be fair, my agent Dave Roberts was very keen for me to ride this horse, so it’s all down to him really. I could have ridden a few in it because Mr Pipe only had Ashkazar in the race and Hadden always rides him, but Dave was very keen on this one. “The rain hasn’t really got into the ground - it’s probably only in the first couple of inches and it’s probably still good enough underneath. He was hanging marginally to the right so I thought that I was better off taking him wide instead of trying to keep him in.